Benefits of coconut oil are many because of its caprylic acid. Its uses includes hair, skin, weight loss, stress relief, bone strength, massage, heart disease, managing cholesterol levels, digestion, kidney problems, dental care, diabetes, dental care, meal preparation, diet, better metabolism, controlling high blood pressure, cancer prevention, curing yeast infections, HIV management and more. When I think about coconut oil, it's hard to believe it isn't found more often in stores. Could it be because of big money that is already behind vegetable oils? Probably a reasonable question seeing that coconut oil was used widely in the past, before World War II, which involved most of the worlds nations. One of the reasons behind the decline in its usage in the United States had to due with the turmoil between Japan and the United States. Back then, coconut oil was coming from the Philippines, which Japan occupied at the time. No matter what gender or age, you can use it for your hair. You can simply put a very small amount in the palm of your hands. Rub your hands together to soften, then run your fingers through your hair reaching the scalp and all over your hair. You only need to use a small amount because a little goes a long way. It will leave your hair shining and may even help your hair to grow if you message your scalp with the oil often enough. Once a day before going to bed would be a good time to use the oil. Be sure to sleep on a towel in case you're worried about getting it on your pillow. Coconut oil can help protect the skin from aging because it is a stable saturated fat that isn't broken down by free radicals. Free radicals damage cell membranes, DNA, fats, etc. and contribute to lines and wrinkles. It provides moisture better than lotions that absorb into the skin too quickly leaving the skin dry again. Because of its antimicrobial properties, it can keep the body and skin healthy and combat acne. You can use it by applying it directly to areas of dryness on the skin. 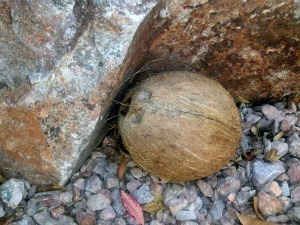 Coconuts are astounding in their antimicrobial abilities. Coconut oil is high in medium-chain fatty acids and contains lauric acid which is also found in mother's milk. Out of all the fats, coconuts provide the highest amounts of antimicrobial properties. Capric acid, caprylic acid, and lauric acid all contain these important health benefits when ingested but lauric acid has the best antiviral activity. These components combined help fight harmful microorganisms and aid in healing diseases and life-threatening conditions such as chlamydia, AIDS, herpes and many more. Need to find certified unrefined organic virgin coconut oil now? Mountain Rose Herbs consistently delivers quality organic coconut oil products. You can get the benefits of coconut oil because they specialize in certified organic herbs, spices and botanicals. Organic farmers must adhere to strict principles and protocols that ensure the best possible products. With the method of extraction that uses temperatures less than 100 degrees, it allows the coconut to maintain its nutritional properties so we can receive the benefits of coconut oil. These powerful nutritional properties can be used as a defense against Candida albicans infections and other illnesses. You can even eat the oil straight from the jar or cook your favorite meal in it. Take a look at their product page for more details.